As we reach for the sky, we might recall that it was on this date in 1975 that a bill headlined by Kevin Coyne and Procol Harum played the “Closing Show” at London’s Rainbow Theater. Built in 1930 as a cinema, it became a major concert venue in the 1960s: The Rainbow was where Jimi Hendrix first burned a guitar, and where The Beach Boys, Pink Floyd, Queen, Genesis, Eric Clapton, Van Morrison, Little Feat, Kool & the Gang, the Ramones, and many others recorded live material for albums, television, and film. 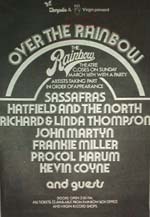 The Rainbow was used again, sporadically, for concerts beginning in 1977. But it was subject to a Historic Preservation Order, the maintenance standards of which the owners couldn’t meet; their plans to convert the space into a bingo parlor fell through, and the venue went dark in 1982. It stayed vacant until the Universal Church of the Kingdom of God, a Brazilian Pentecostal order, converted into the church that it is today.